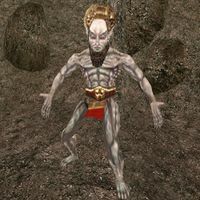 Dagoth Araynys is one of the Ash Vampires, and brother to Dagoth Ur. Vivec suggests killing him in order to weaken Dagoth Ur. If you kill Dagoth Ur first, all the other Ash Vampires will die with him. Dagoth Araynys may be found in Mamaea, Sanctum of Black Hope. He carries the Soul Ring artifact. Though he has dialogue saying that by the customs of House Dagoth, challengers are to attack first, Dagoth Araynys will attack the player on sight unless they are using Chameleon, Invisibility, or have cast a Calm spell on Araynys. However, extensive testing in the community suggests that this has no effect on your final battle with Dagoth Ur. Dagoth Araynys has some unique dialogue, if you can sneak up on him or cast Calm in order to speak to him. Greeting 1: "You've done well to come this far. I don't think we have anything to talk about, do we? Then let's get on with it." Greeting 2: "I'm ready whenever you are." get on with it: "I'm going to kill you. You don't believe that, or you wouldn't be here. You are the challenger, so, by House Dagoth custom, yours is the first move." This page was last modified on 24 February 2019, at 15:00.